I ABSOLUTELY LOVE MY RING! I WAS SO NERVOUS OPENING THE BOX. I KEPT THINKING, I HOPE THAT I AT LEAST "LIKE IT"....I DON'T HAVE TO LOVE IT, BUT I HOPE I LIKE. I WAS WONDERFULLY PLEASED SEEING MY NEW RING AND I LOVE IT. I CAN'T KEEP THE SMILE OFF OF MY FACE. I THANK YOU SO MUCH FOR PUTTING YOURSELF IN MY SHOES AND SEEING TO IT THAT I GOT A RING THAT I WILL TRULY WEAR FOREVER! THANK YOU. This is a beautiful pair of 14k white gold round diamond stud earrings. Each .37 carat diamond in the pair has a color of G-H and a clarity of SI. These earrings have security screw posts for pierced ears. Total carat weight of pair is .75 carat. 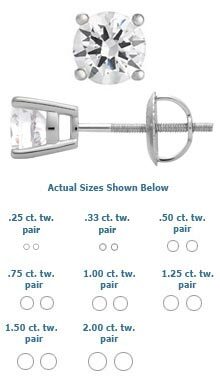 * Carat total weight has a variance of + or - 0.05 carat.